In "Ethical Explanations: the Ethics of Software Documentation," I argued that the writing of documentation involves similar ethical responsibilities to the writing of fiction, or the documenting of government/public processes. I talked about software development process, translation, and the ethics of choosing writing techniques. I gave the talk in 2008, when I served on the senior program committee of WikiSym, the International Symposium on Wikis and Open Collaboration. 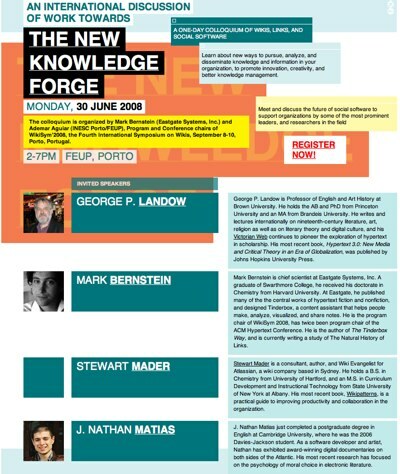 When George Landow, Mark Bernstein, Stewart Mader, and I traveled to Porto to plan the conference with Ademar Aguiar, we also gave a half day of talks at FEUP and INESC Porto on information management topics.